The Nature Trail is shown in green in the above map; the Desert View Trail is shown in dark blue. This plant trail guide covers only the Desert View loop trail itself; the other portions that must be walked in order to get to and return from this loop trail are part of the Long Valley Nature Trail. No permit is required. The total walking distance to do the Desert View Trail from the Tram Concrete sidewalk is 1.3 miles, with 200 feet of total elevation gain and loss. The portion covered by the plant trail guide below is 0.9 miles. The loop can be done in either direction, but this guide travels the loop in a clockwise direction as seen from above, as shown by the blue arrow on the map above. 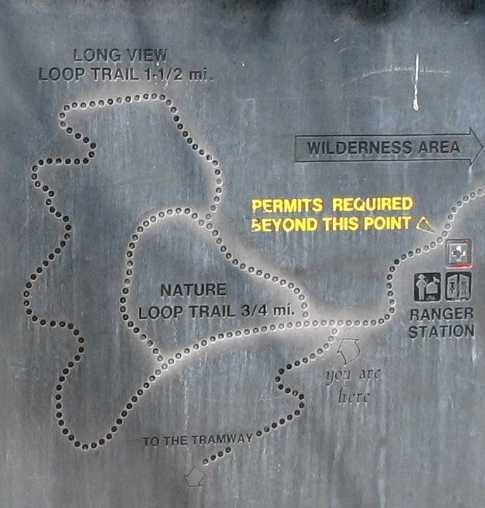 the map at the trailhead distorts the Nature Trail and makes it appear wider than it is, probably to fit the name inside the trail on the map. This trail has been covered just once for this guide, on 8/16/07 in a drought year. More species would probably be seen in a normal rainfall year, as well as more specimens of some species found in the guide. This trail, and the connecting Nature Loop Trail, are the only trails, out of the 114 for which we have produced plant trail guides across southern California, that contain a leach field from a septic tank. This leach field produces the densest stand of wild tarragon, Artemisia dracunculus, that we have ever seen. The following histogram gives the number of trails in our database that contain each taxon on this trail (not including the taxa seen only off-trail given at the end of the guide). We had 114 trails in our database when this histogram was made; 13 of those trails, including this one, are in this area of San Jacinto Mountain. A number of "1" means the taxon has only been found on this trail among the trails in our database; numbers of "13" or smaller may indicate taxa found only in this area of San Jacinto Mountain. We found 1 additional species not in the above table, since they have not been fully identified yet. The unidentified ones are marked with ? or sp in the id? column in the guide, and have no entries in the #all column. We thank Philip Erdelsky for help with the fieldwork on 8/16/07, and for taking the picture of the trail map at the trailhead. The mileages in the guide come from a GPS recording of this trail on 8/16/07, measured with Topo!. They are probably accurate to 0.01-0.02 mile. #: On-Trail species are numbered in order of first occurrence on trail (touchable without leaving the trail). Off-trail species are in parentheses. Copyright © 2007-2017 by Tom Chester, Dave Stith, Keir Morse, James Dillane and Eric Baecht.